Lyme disease wasn't much of a problem in Pittsburgh just 10 years ago. In fact, the CDC had zero reported cases for Allegheny County in 2007 (see map). Unfortunately, that's not the case today. Southwestern Pennsylvania is plagued with Lyme, thanks in part to our recent shorter, milder winters. In 2012, we started seeing dogs show Lyme positive results when performing their annual heartworm test (it also screens for three tick-borne diseases: Lyme, Ehrlichia, & Anaplasma). The numbers of affected dogs have continued to grow, and it's now typical to see several patients per week that have been exposed to Lyme. ​Our dogs are at risk, and so are we. Many clients have offered stories about their own experiences with Lyme. People often don't realize that they've been bitten by a tick until their doctor diagnoses an infection. Similarly, we frequently see dogs that test positive, and their owners had no knowledge of a tick attachment. It's important to remember that even if your dog is a white fluffy couch potato, she still goes outside to "do her business," and the ticks are waiting. We can bring them in on our clothes, too! What can I do to protect my dog from Lyme disease? Have your dog vaccinated for Lyme disease (and keep up with annual boosters). 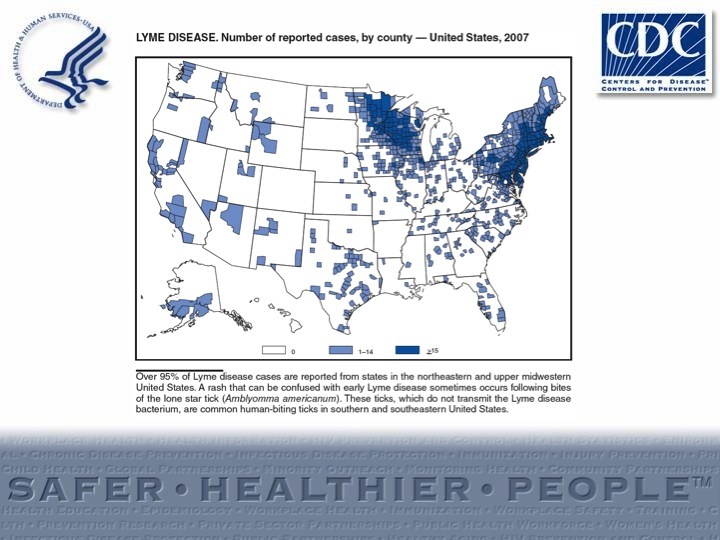 The Lyme vaccine helps to decrease the likelihood of disease transmission. Based on recent studies, the vaccine schedule for best protection includes a series of two vaccines 2-3 weeks apart, one at 6 months, then one at 1 year. The Lyme vaccine needs annual boosters to continue to protect your dog. Screen annually for exposure using the 4Dx Snap Test. This is the same test we use to detect heartworm disease, and will let us know if your dog has been exposed to Lyme. It works similarly to a pregnancy test, giving us a "yes, exposure" or "no, no exposure" result. To confirm an active infection, our veterinarian will likely recommend further testing to accurately determine of the level of antibodies in your dog's blood (called the Quant C6 Antibody Test). Use a safe, effective flea & tick preventative. Keeping ticks off of your pets and preventing them from having the opportunity to bite and transmit Lyme (or other tick-borne diseases) is one of the easiest ways to keep your companions safe. ​​Avoid over-the-counter preventatives: there are no regulations requiring safety studies for OTC flea and tick preventatives, and many of these products contain harsh insecticides that may be dangerous for your pets. Read the label: Make sure the product's label matches your pet's weight, and that it is labeled for your pet's species. Never, ever apply a product labeled for "dogs only" to your cat. It could have deadly consequences! Know your options: Some pets dislike the sensation of topical medications, or may have sensitive skin. We carry several flea and tick prevention products that suit a variety of situations. If you're not sure which is right for you, just ask! What are common signs of Lyme disease? Many people are familiar with symptoms of Lyme in humans: the telltale "bullseye rash," fatigue, & joint pain. Dogs don't present with the rash (and even if they did, it'd be hard to see under all that fur!). Signs of Lyme disease in dogs are subtle at first, and usually develop several months after the tick bite. Early signs can include fever, lethargy, and decreased appetite. Clients commonly come in for an exam when their dog starts showing signs of joint pain and swelling. Often, a dog with an active Lyme infection will present with what we call "shifting leg lameness." In other words, he'll favor one leg for awhile, then shortly after will limp on a different leg. Although less common, Lyme disease also has the potential of causing disease in the kidneys, heart, and nervous system. If you're concerned that your dog is showing signs of Lyme disease, please call to make an appointment, or request one online. What do I do if I find a tick attached to my dog? Sometimes ticks will attach despite our efforts to keep them off. If you find one, you want to safely remove it. We carry tick tools that can help making removing ticks from your pets easier, and if you're nervous about taking it out yourself, we can safely do it for you! ​Note that it is impossible to tell by looking at a tick whether or not it carries Lyme disease. It takes several weeks after exposure before antibodies will be detectable in the blood, so if you'd like your dog to be tested, note the date of the tick attachment and call to set up an appointment for at least 6 weeks later. ​How do I keep ticks out of my yard? The CDC recommends creating "tick-free zones" by designing your landscaping to be unattractive to ticks. Wear long sleeves and pants when clearing brush or walking through the woods. When hiking, stick to wide, well-maintained trails whenever possible. Apply insect repellent with at least 20-30% DEET to exposed skin and clothing (do not use this on your pets). Do a "tick check" after being in tick-friendly environments. Check your skin, clothing, and backpack, if you carry one. If you can, take a shower within 2 hours of returning home. Wash and dry clothing with hot water and high heat. If the fabric can't withstand high temperatures, tumble dry with low heat for at least 90 minutes after washing. Have more questions about ticks or Lyme disease? We're only a phone call away!